Can I receive healthcare if I don’t have insurance? Yes, you can! 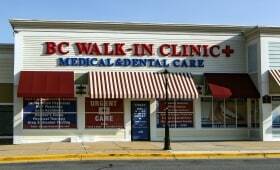 Our Walk-In Clinic has special discounts for self-pay patients. Regular office visits start at just $100. Can I receive healthcare if my insurance provider isn’t listed? In most cases, you can receive urgent care at our clinic and submit your bill to your insurance carrier for reimbursement. Please note that we’ll collect our fees for services during your visit directly from you. Any reimbursement that you might be eligible for is a matter for you and your insurance company to work out together.